“This decision will be announced very soon – how this all will be accomplished – and my expectation is that if Romania is asked to participate, they will do so as they have done in every NATO venture so far, and have been a great host and great allies,” NATO Commander, US European Command, General Breedlove said. 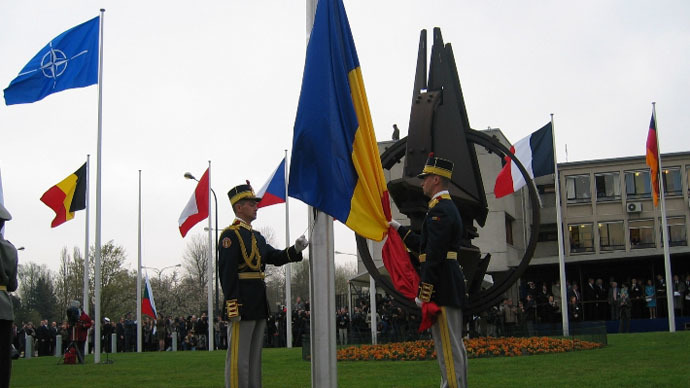 The commander did not elaborate on what kind of weapons NATO plans to deploy in Romania. Experts however believe that Romania will soon house a range of armored vehicles, anti-aircraft weapons systems, combat aircraft and artillery. As far as stationing NATO’s heavy military equipment in Romania, a portion of political analysts agree that NATO is just securing the alliance’s geopolitical borders and preparing for a long confrontation with Russia. The president of the Academy of Geopolitical Problems, Dr. Konstantin Sivkov, told Sputnik that this is part of an overall strategy by NATO to secure its eastern borders gained after the dissolution of the Warsaw Pact. NATO, Siskov believes, could use such fortifications to potentially conduct a military operation that might aim to “take Moscow” within a month, if not countered by adequate measures. Given Romania’s vicinity, the fly-in time of NATO jets to a number of Russian key hubs and airfields would be reduced to less than half an hour, Siskov warned, adding that extraordinary measures should be taken to avert potential threats posed by NATO. Breedlove and Romanian officials discussed the missile defense bases planned in the Romanian town of Deveselu due to become operational this year, although he did not comment on those talks during the press conference. NATO is ready to defend against so-called Russian belligerence, Breedlove stated. The exercise tested many things that “hadn't been done for a long time in NATO ... like multiple border crossings and which bridges are capable of handling the vehicles,” Breedlove said. And while Breedlove hailed the support of locals each time the convoy passed through another city, he failed to mention protests that accompanied NATO’s forces along the way, the latest one in Prague, Czech Republic. The Dragoon Ride started last week from Estonia and passed through Latvia, Lithuania and Poland, before entering the Czech Republic on its return journey to a Germany in the city of Vilseck. Anti-war protesters along the way decried NATO drills that have intensified this year and the alliance’s reach in Eastern Europe. Russia sees the recent actions as additional proof that NATO is an anti-Russian military bloc that has taken advantage of the Ukrainian conflict, using it as a pretext for a military build-up in Eastern Europe. Since the beginning of March, six NATO warships participated in naval drills in the Black Sea. The operation, headed by the US, included anti-air and anti-submarine exercises. The 3.5 month series of joint exercises commenced in Bulgaria. About 350 US army officers, as well as US tanks, helicopters and armored personnel carriers, came for the drills. The US also delivered over 120 armored units, including tanks, to Latvia in March and has deployed twelve A-10 Thunderbolt II attack planes in Germany. Back in in January NATO stationed additional troops in the three Baltic states – Romania, Bulgaria and Poland – as part of its new strategy. At the same time NATO plans to install command-and-control centers in Latvia, Estonia, Lithuania, Poland, Romania and Bulgaria by the end of 2016. Foreign Ministry spokesman Aleksandr Lukashevich last week said that Russia has all the means to counteract missile shield in Europe. He said that “it’s high time the US renounced destructive unilateral moves in the sphere of missile defense, then there would be no need to worry about their consequences,” TASS reported. Russia has repeatedly said it views the antimissile program as a threat, despite reassurances from Washington. “Consistent US military build-up at the Russian borders in line with NATO’s plans to strengthen military presence and develop infrastructure at the so-called eastern flank...not only provokes tensions in the region, which has been considered one of the most buoyant in Europe, but also has long-term negative consequences,” Lukashevich added.